Opportunities available to join our team and work with us. Local MoRunning promoters required. To find out more please email us. MoRuns rely on the amazing support from volunteers. Roles include marshalling on the course, working on registrations or bag storage, on the water stations or general event hub support. If you fancy being part of our great team please get in touch to express interest about your local MoRun. Have you got a story you want to share? If you want to inspire others, increase exposure about your challenge, fundraising or just raise awareness for Men's Health we would love to hear from you. Help us promote MoRunning. 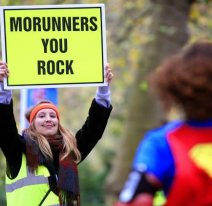 The more people that talk about MoRunning the better! If you want us to send flyers or posters please get in touch.